Let’s face it — in a province as big as Manitoba, owning a car makes life easier. And now, with LowestRates.ca’s car loan service, getting a car loan is easy too, even if you have bad credit. Applying only takes a few minutes and almost everyone gets approved. Then you can shop for your new wheels. Just like that. Complete your car loan application in minutes. Get a car loan even with bad credit or no credit. Qualify for a loan ranging from $5,000 to $40,000. Get access to competitive rates across Manitoba. Applying doesn’t cost you a cent. Can I get a car loan even if my credit is bad? Yes. Despite what some banks might tell you, bad credit doesn’t mean you can’t get financing. In fact, our car loan service specializes in auto loans for Canadians with bad credit. So even if a bankruptcy, divorce, or other financial setback previously damaged your credit, we can help you get financing for your car. What do I need to qualify for a car loan in Manitoba? A minimum income of $1,500/month, Canadian residency, and a valid driver’s license. Just meet those basic requirements, and we’ll match you with a dealer. I don’t live in a big city like Winnipeg or Brandon. Can you still match me with a dealer? Of course. One of the great things about our car loan service is that we work with an expansive network of licensed Manitoba dealerships. So don’t worry — matching you with a nearby dealer is what we do. Can I get a car loan if I’m a new driver? Yes. As long as you’re licensed and meet our other car loan requirements, we can help you get a loan. Your payments will be based on a couple different factors, including your loan amount, interest rate, and the length of your car loan. When you’re matched with a dealer, ask for more details. Don’t be afraid to negotiate on the interest rate. What’s the sales tax on a vehicle purchased in Manitoba? When you buy a new or used vehicle from a licensed car dealership in Manitoba, you have to pay 5% GST and 8% RST (Retail Sales Tax). 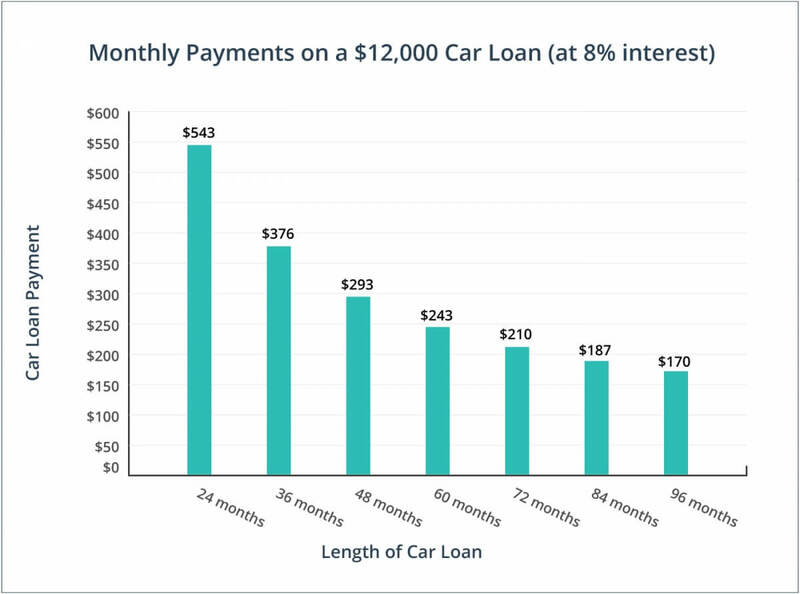 How does the length of my car loan affect my monthly payments? Longer car loans break your principal balance up into a greater number of smaller, more manageable payments. A shorter car loan does the opposite. For example, a 6-year car loan splits your balance (ex. $12,000) into 72 monthly payments of $210 — refer to our graph below. But a shorter loan, of, say 2-years, splits your balance into 24 payments of $543. The longer loan seems like the more attractive offer, but there’s one more factor to consider: the interest charges. At the end of that 6-year car loan term (72 months), you will have paid $15,120 with the interest included. At the end of a 2-year term (24 months), you’ll have only paid $13,032 — that’s a pretty big difference. You'll have to make bigger payments right away, but you could save thousands of dollars in interest over the life of your loan. You'll also pay off your car loan debt in less time. Use the vehicle identification number (VIN) to get a history of the used car. If it was ever rebuilt, stolen, or significantly damaged in an accident, the report will have the details. Licensed dealers are required by law to share important details about the car’s condition, history, and warranty. They’re also required to follow strict regulations under the Manitoba Consumer Protection Act. In other words, you’re protected when you buy from a licensed dealer. Manitoba Public Insurance (MPI) classifies certain vehicles as “Most-at-Risk”. Cars with this designation are considered at least two times more susceptible to theft than the average vehicle. If the car you want to buy is on the Most-at-Risk list, it’s required to have an immobilizer. Immobilizers prevent your car from starting unless the driver has an accompanying transponder (usually fastened to a keychain). I can’t get a car loan if I’m new to Canada and don’t have any credit history. False. If you’re a Canadian resident, you’re definitely eligible for a car loan. We can work with the no-credit-history issue too. In fact, that’s not an issue for us. The dealers we work with actually specialize in no-credit car loans. I can use my car loan at any Manitoba dealership. False. You can only use your auto loan to purchase a car from the dealer we matched you with. After all, it’s the dealer that gives you the loan. If the “Most-at-Risk” car I bought doesn’t already have an immobilizer, it doesn’t need one. False. Even if it wasn’t sold with one, your car will need an immobilizer. Dealers can sell Most-at-Risk vehicles without immobilizers as long as they tell you the car requires one. You’ll have to buy and install an approved immobilizer before you can legally drive your new car in Manitoba. Used car shoppers often have lower credit scores, so the risk of default is higher. In case you do default, the resale value for a used car will likely be lower than the resale value on a new car. The growing popularity of longer car loans is keeping a lid on monthly payments — even as car prices increase. The Financial Consumer Agency of Canada reports that between 2010 and early 2015, the average monthly car loan payment rose by only 3.8%. Manitoba’s auto market is on a hot streak. Over 50,000 new vehicles were sold each year from 2012 to 2015. Manitoba has a workforce of drivers. According to Stats Canada, 72% of Manitoba’s commuters drive to work instead of taking public transit or other modes of transportation. The Consumer Protection Office means business when it comes to transparent pricing. Under Manitoba’s Consumer Protection Act, the Office can fine car dealerships just for listing the finance price before the cash price in an ad. Power to the consumer: by law, licensed dealers have to dish the details on a car — including whether it’s ever been written off or damaged — before you buy it.